Watch Innovations to learn about the latest advances in hemp and cannabis technology. 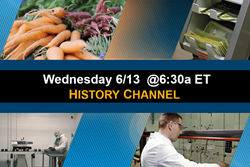 Innovations with ED Begley, Jr. will focus on the cannabis industry on a new episode, scheduled for broadcast on Wednesday, 6/13 at 6:30aET/PT via the History Channel. Working to increase sustainability, biodiversity, air quality, and more, Organic Ag Products (O.A.P.) follows natural growing practices to provide superior, safe, and successful products for all aspects of organic crop protection. Innovations will educate viewers about O.A.P.’s suite of products, and how they cover the needs of organic farmers. The show will also take a look at Block and Company, which has been working with Banks and many types of businesses since 1934 – serving customers in highly regulated industries. Viewers will learn about Block and Company’s solutions for cash heavy businesses, like those operating in the legal cannabis space, and how these solutions boost productivity, improve efficiencies, and minimize risk – ultimately saving customers time and money. Medical Marijuana Inc. (MJNA), one of the first publicly traded cannabis companies, will also be featured in this episode. The segment will explore CBD, its benefits, and how MJNA uses science and technology to advance treatment options for patients suffering with chronic conditions. Finally, Innovations will discover how Cannabis Compliance is helping cannabis businesses navigate the constantly shifting regulatory framework that defines the cannabis industry. From quality assurance to regulatory licensing, business planning, and more, audiences will see how Cannabis Compliance advises businesses to grow their company, successfully.